Social studies is a discipline where the ability to critically understand concepts, think through issues, and grasp complex ideas is key. 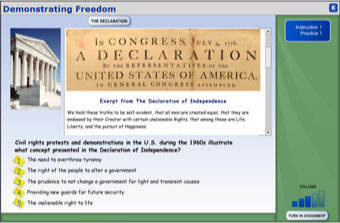 The social studies lessons in the GED Academy, TASC Prep Academy, and HiSET Academy are geared toward thinking skills, to help ABE, pre-secondary, and high school level students better understand the issues of the U.S and world history, civics, government, economics and geography. 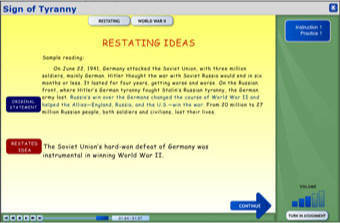 Students are also introduced to fundamental ideas within social studies disciplines. 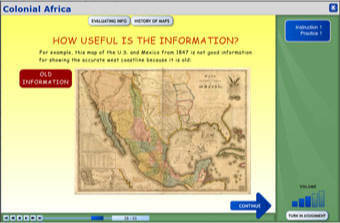 Students learn how to read, understand, and analyze social studies texts, and are given rich supplemental material about social studies concepts. The skills taught include interpreting graphic information, understanding words in context, constructing meaning, recalling information, applying information, analysis, and evaluating and extending meaning. Visual literacy is a critical skill when it comes to grasping the magnitude of meanings implied in social studies content. Lessons go deep to explain the nuances and inferences behind statistical and graphical data. 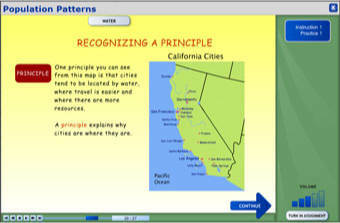 Students learn to understand, interpret, and evaluate information using charts, graphs, and tables. 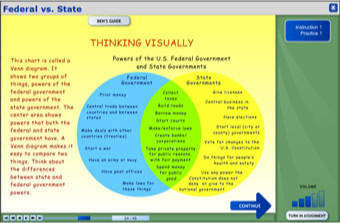 Students also learn to think visually about signs, posters, photographs, and other images. Vocabulary is a common stumbling block for adult learners who struggle to understand written materials. Social studies introduces some big words into the lexicon of the adult basic education learner. Reading passages expose students to unfamiliar words while teaches strategies to comprehend meaning. Social science lessons teach important skills to help learners gain real meaning from the texts that they read. Students learn to understand and restate information, identify main ideas, summarize ideas, identify facts, recognize principles, understand point of view, and identify implications and make inferences. These skills help learners interpret information to gain relevant and valid knowledge. The foundational skill for interpreting and creating meaning from texts and graphic information is comprehension. By learning to recall information, students learn to absorb details and main ideas from their texts. Summarizing and restating what has been read helps students form connections and learn to recall information. Students gain the application skills needed to solve problems and utilize information. Lessons provide skills for using information in new contexts, solving problems, identifying a principle or generalization, and applying principles and abstract ideas to problems and situations. Application skills allow students to truly use their knowledge. Students will need to demonstrate the ability to analyze information and pull out what is critical to answer questions on high school equivalency tests. Learners also examine points of view of individual writers and among varying writers. By examining an individual writer's point of view, or by contrasting opinions of two different authors, students learn strategies for drawing conclusions, identifying patterns, and understanding facts and opinions. Being able to recognize unstated meanings, fallacies, and evidence, the student will use analytical skills to validate ideas. Lessons help students compare ideas, assess the values of evidence and conclusions, make choices based on arguments, understand the role of values in beliefs and choices, and identify logical fallacies. Students learn tools to make good arguments, evaluate others’ arguments, and make strong decisions. Instruction is presented in the same way that students will encounter social studies questions on any high school equivalency test. In working through social studies lessons, students are exposed to the types of social studies questions presented on the GED® Test, TASC Test™ , or HiSET Exam®.